This article is sponsored by AMD. Just as you would build a house, you need a good foundation to build a powerful PC. In the tech world, every rig starts with the processor. AMD’s 2nd Gen Ryzen processors offer something for everyone. Built with advanced 12nm transistors, improved SenseMI technology, StoreMI, and reduced memory latency, their premium performance can take your gaming experience to the next level. We’ve compiled a quick guide to help you make your choice a little easier. The AMD Ryzen 7 2700X and Ryzen 7 2700 are the best choices for those who work hard and play hard. Rocking a whopping 8 cores and 16 threads, the Ryzen 7 series boasts phenomenal multitasking capabilities. Professional content producers who work with image compression, video transcoding, and encryption would also enjoy an accelerated workflow. The Ryzen 7 processors are also highly recommended for gamers who want to share their epic moments through streaming. Due to the need for heavy encoding, streaming can be a very taxing process. Software encoding, or encoding with the CPU, is generally preferred if you want the best quality. But doing so on a processor without adequate resources, however, can lead to tons of dropped frames, stutters, lags, and massively reduced gaming performance. That’s not a problem for the AMD’s Ryzen 7 series as their high core count can readily handle games at breakneck speeds while maintaining a smooth, uncompromising stream quality. If you’re an avid gamer who also occasionally dab in video and photography, then the Ryzen 5 series of processors is right for you. With 6 cores and 12 threads, the Ryzen 5 2600X and Ryzen 5 2600 sits at the sweet spot of performance and value. Their six cores are more than capable of handling today’s most demanding games as well as light to medium image and video processing. The Ryzen 5 2400G is a good candidate for those who need the processing power of 6 cores and 12 threads as well as integrated graphics. It features 11 powerful Vega graphics cores built in. For users who need a powerful machine that sips power, be sure to grab the Ryzen 5 24000GE. The Ryzen 5 2400GE has the same specifications as the Ryzen 5 2400G, but comes in at a lower 35W TDP (Thermal Design Power). In addition to boasting 4 cores and 8 threads to tackle all your work and multimedia needs, the Ryzen 3 2200G also comes with blazing fast Radeon RX Vega graphics built-in. Featuring 8 of the same graphics cores as AMD’s flagship Vega 64 and Vega 56 graphics cards, the integrated graphics can drive excellent frame rates in competitive eSports titles including Dota 2, League of Legends, Fortnite, and Counter-Strike. Its premium performance in both graphics and processing power makes it an easy recommend for gamers on a budget. Just like the Ryzen 5 series, the Ryzen 3 2200G has a counterpart with a lower TDP. The Ryzen 3 2200GE also sports 4 CPU cores and Vega graphics, but lowers the TDP to just 35W. If efficiency is a priority, then the Ryzen 3 2200GE stands as a great choice. In addition to elite performance, the nice thing about upgrading to the 2nd Gen Ryzen processors is how easy it is. If you’re the owner of a first-generation Ryzen motherboard, then upgrading is as simple as swapping out the CPU and performing a quick BIOS update. Both 1st gen and 2nd Gen Ryzen processors use the same AM4 CPU socket and offer backward/forward compatibility. 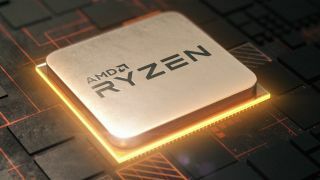 AMD plans to support the AM4 socket until at least 2020, so you can even upgrade to newer chips down the road as they arrive. Gamers looking to join the Ryzen family for the first time can find an abundance of excellent AMD motherboards, each with the right features you need. We recommend the Gigabyte Aorus X470 for the high-end and the Gigabyte Aorus AX370 for our budget pick. Of course, there are plenty more selections from reputable brands such as ASUS, MSI, and ASRock. Whatever your choice may be, all 2nd Gen Ryzen processors (with the exception of the Ryzen 5 2400GE and Ryzen 3 2200GE) come with a chilly Wraith cooler. The coolers included with the high-end Ryzen 7 2700X is also decked out with user controllable RGB lights, helping you to show off all your hardware in full display. To learn more about 2nd Gen Ryzen and its benefits, read our full review or make a visit to AMD.